Bill Russell and Red Auerbach of the Boston Celtics combined to win seven NBA Finals against the Lakers. Two years ago, the SportsLifer previewed the 2008 NBA Finals between the Boston Celtics and the Los Angeles Lakers with a look back at their history in championships matchups. Well the Celtics won that series in six games, their 17th NBA title overall and first in 22 years. Paul Pierce was named Finals MVP. The Lakers responded in 2009, returning to the Finals for the sixth time in 10 years. Kobe Bryant led the way as Los Angeles beat Orlando in five games to won its 15th championship. Now the two clubs who have combined for more than half of all NBA championships are meeting for the 11th time, with the Celtics holding a 9-2 advantage in previous meetings. They’re the Lennon and McCartney of basketball, the Rogers and Astaire of hoops, the Batman and Robin of the hardwood. They’re the Celtics and the Lakers. These two trademark NBA fantasies have combined for 30 championships, 16 by the Celtics. They’ve clashed 10 times in the NBA Finals, beginning in 1959 when the Celtics swept the Minneapolis Lakers in four straight to start Boston’s run of eight straight titles. The Celtics won the first eight matchups; four went the full seven games. The Lakers took the final two, the last in 1987, each in six games. In 1962, Frank Selvy of Los Angeles had an open jumper with a chance to beat the Celtics in Game Seven. He missed and Boston won in overtime behind 30 points and 40 rebounds from Bill Russell. In that Series Laker forward Elgin Baylor scored an NBA playoff record 61 points to lift his team to a Game 5 win at the Boston Garden. However, with a chance to win the championship on their home floor, the Lakers lost Game Six, and the combatants returned to the Boston Garden for the finale. The following year, Boston’s Bob Cousy dribbled out the clock in the final game of his historic career as the Celtics once again triumphed, this time in six games. In 1966, the Celtics held on for a 95-93 win in Game Seven to complete their run of eight straight titles. Boston coach Red Auerbach retired after the game, with Russell assuming player-coach duties. The Celtics won another seven-game showdown with the Lakers in 1969, although Jerry West, right, was the MVP of the Series, the only player from a losing team to win the NBA Finals MVP. West, whose 29.1 playoff scoring average ranks third to Michael Jordan and Allen Iverson, had 42 points, 13 rebounds and 12 assists in Game Seven, but Boston prevailed 108-106 at the Los Angeles Forum. Lakers’ owner Jack Kent Cooke was already planning his victory celebration as he ordered thousands of balloons suspended from the Forum rafters. The Celtics and Lakers resumed their rivalry 15 years later as Larry Bird and Magic Johnson, right, squared off for the first time in the playoffs. And the Celtics again won in seven games, Bird averaging 27.4 points and 14 rebounds per game to win MVP honors. The next year, Kareem Abdul-Jabbar was the Finals MVP and the Lakers finally beat Boston, 4-2, after eight straight playoff losses. And in 1987, Magic Johnson was the Finals MVP, his “junior sky hook” proving to be the turning point of the series, giving the Lakers a 3-1 lead on the way to a six-game triumph. And they haven’t played since. The Celtics haven’t won an NBA title since 1986, The Lakers won the title again in 1988, beating the Detroit Pistons. Los Angeles last won in 2002, completing a three-peat with a sweep of the New Jersey Nets. 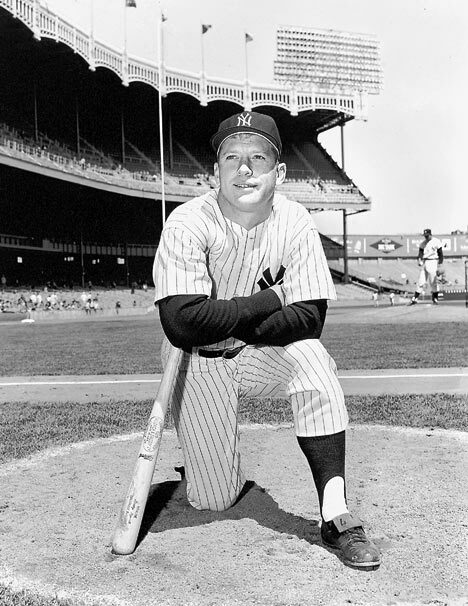 Yankee slugger Mickey Mantle was New York’s best center fielder in the mid 50s. Baseball was king in New York in the early and mid 50s, before the Dodgers and Giants bolted for the West Coast. In the eight years between 1949 and 1956, New York teams kept a stranglehold on the World Series. During that stretch, the Yankees won six World Series, the Dodgers and Giants one apiece. The Yankees won the American League pennant in 1957, before the departure of the Dodgers and Giants to California following the season. If you’re talking about best all-time, Mays, fourth all-time with 660 home runs, gets my vote. But who was the best during the days when Willie, Mickey and the Duke roamed the pastures of the Polo Grounds, Yankee Stadium, and Ebbets Field. First, the criteria. Snider was five years older than Mays and Mantle, both of whom were rookies in 1951 and did not play full seasons. Due to military service, Mays missed all but 34 games in 1952 and the entire 1953 season. So we’ll skip those years, and use these four seasons — 1954, 1955, 1956 and 1957 — for the comparison. In those four seasons, Willie, Mickey and the Duke combined for three MVPs, home run, RBI and batting championships including a Triple Crown, overall league leadership in 37 major categories, six pennants and three World Championships. Wow. Mays: 41 HR; 110 RBI, .345 BA. Led league in batting, triples (13), slugging (.667) and OPS (1.078). National League MVP, Giants beat Indians in World Series, 4-0, sparked by Mays Miracle Catch, above right, in Game one. Mantle: 27 HR, 102 RBI, .300 BA. Led league with 129 runs. 15th in American League MVP balloting. Snider: 40 HR, 130 RBI, .341 BA. Led league with 120 runs, 378 total bases. 4th in ML MVP. Mays: 51 HR, 127 RBI, .319 BA. Led league in triples (13), home runs, slugging (.659), OPS (1.059) and total bases (382). 4th in NL MVP. Snider: 42 HR, 136 RBI, .309 BA. Led league in runs (126) and RBIs. 2nd in NL MVP. Snider hits four homers, Dodgers beat Yankees in World Series 4-3 to win Brooklyn’s first and only championship. Mays: 36 HR, 84 RBI, .296 BA. Led league in stolen bases (40). 17th in NL MVP. Mantle: 52 HR, 130 RBI, .353 BA. Won Triple Crown, also led league in runs (132), slugging (.705), OPS (1.169) and total bases (376). AL MVP. Mantle homers three times, Yankees beat Dodgers, 4-3, to win World Series. Snider: 43 HR, 99 RBI, .292 BA. Led league in HR, RBI, slugging (.598), OPS (.997). 10th in MVP. Won NL pennant, lost to Yankees 4-3 in World Series. Snider: 40 HR, 92 RBI, .274 BA. 18th in NL MVP, left. Clearly, Mantle gets the edge with his Triple Crown 1956 campaign, and American League MVPs in both 1956 and 1957. Mays gets the nod in 1954, when he returned from the military, won the batting title, and was named National League MVP. And Snider takes 1955 after leading the league in RBIs and finishing second to teammate Roy Campanella in the MVP race. Three great centerfielders, four amazing years. Willie, Mickey and the Duke. Well, he swore he was the Oklahoma Kid. To go and see the Duke. Bill Simmons, the ESPN Sports Guy, hits a three-pointer with “The Book of Basketball” (Ballantine Books) a wildly entertaining treatise on professional basketball, and the players and teams that make the sport special. Simmons, a native New Englander, fellow Holy Cross alum (the SportsLifer was class of 73) and admitted Celtics fan, fills the “Book” with levels, pyramids and categories, remindful of Cosmo Kramer’s interior design in his Manhattan apartment. The most fascinating debate in the book is the selection of the top 96 players in NBA history. Michael Jordan as number one should hardly surprise anyone, although defining Jordan the all-time, forever pick isn’t defensible. Who’s to know there’s not some kid on the horizon, born already, who will someday surpass Jordan’s numbers and his “pathological competitiveness, command of the room and mystique.” Never say never, always or forever. Anyway, after Jordan, the rest of Simmons’ top 10 in order is Bill Russell, Kareem Abdul-Jabbar, Magic Johnson, Larry Bird, Wilt Chamberlain, Tim Duncan, Jerry West, Oscar Robertson and Hakeen Olajuwon. Duncan is the only active player on the list, but Kobe (15) and LeBron (20) are coming. BTW, the 01 Lakers are #5 on the all-time team Book of Basketball list, behind the second-ranked 96 Bulls, third-ranked 87 Lakers, and fourth-ranked 89 Pistons. The best part of “The Book of Basketball” is the wacky style and creative, rambling prose of the Sports Guy. For instance, this is how he describes Allen Iverson, #29 on the all-time list. Hmmm, that’s interesting. The Answer. Who knew. Lastly, you can’t do the book justice without reading the footnotes, like this one on Bob Cousy, another former Holy Cross Crusader. And of course Rick Robey was Wick Wobey. Babe Ruth warms up before a start at the Polo Grounds in New York. Several weeks back, WFAN’s Mike Francesa claimed that Babe Ruth did not have a pitching history with the Yankees. Au contraire Sports Doctor, Ruth appeared in five games with the Yankees and won them all, despite a 5.52 ERA. Babe Ruth was and still is the greatest player in baseball history — only the Bambino excelled as both an everyday player and a pitcher. Fans can recite many of his batting exploits — his 714 home runs, still third on the all-time list, 60 home runs in 1927, his two three home run games in the World Series, his called shot against the Cubs in the 1932 World Series, a .342 lifetime average. Need we go on. Almost forgotten amongst the distractions of the Babe’s home runs and his gigantic personality is the fact that he was a tremendous left-hand pitcher, the best in the American League between 1915 and 1919, before the Red Sox made him a regular outfielder. Ruth won 23 games for a championship Boston team in 1916 and another 24 in 1917. He threw a record 29 2/3 successive scoreless innings in World Series play, a record finally eclipsed by Yankee southpaw Whitey Ford in 1961. The Babe was a regular in the Red Sox rotation for four years. In 1919 he fashioned a 9-5 record, but became a full-time outfielder that year and led the American League with 29 home runs and 114 RBIs. The following year he was sold to the Yankees. Ruth wound up his career with a 94-46 record, 17 shutouts and 2.28 ERA. Ironically enough, the man noted for home runs surrendered a grand total of just 10 in 163 appearances. Oh, back to those Yankee wins. Ruth won his first game for the Yanks in 1920, his first year with the team. And 13 years later he won his final game to extend his New York record to 5-0. June 1, 1920: Facing the Washington Senators at the Polo Grounds, Ruth left with a 12-2 lead after failing to retire a batter in the fifth. Ruth was relieved by Hank Thormahlen, but got the win, according to the rules of the day, as the Yankees won 14-7. June 13, 1921: Ruth started and pitched five innings, giving up four runs in a 13-8 Yankee win. The Bambino also homered twice in three at bats and knocked in three runs to help his own cause. October 1, 1921: Later that year, again at the Polo Grounds, Ruth came on in relief in the eighth inning with the Yankees leading the Philadelphia Athletics 6-0. Babe immediately allowed the A’s tie the score with six runs, then pitched three scoreless innings and earned the victory when the Yanks scored in the 11th inning to win 7-6. Although he didn’t hit any homers, Ruth did steal his 16th base of the season. September 28, 1930: Nearly nine years later, Ruth, now 35, started against the Red Sox at Boston’s Braves Field on the final day of the season. And the Bambino pitched a complete game, allowing three runs on 11 hits in the Yankees 9-3 win. October 1, 1933: Staked to a 6-0 lead in his last major league start, this one at Yankee Stadium in the final game of the year, Ruth went the distance and held on for a 6-5 win against the Red Sox. The Sultan of Swat also battled a solo home run in his final mound appearance.